Last week the hubs came home from a fishing trip to Florida with a stack of fresh saltwater fish including grouper, snapper and mackeral. Living in the Midwest, these fish don’t make it to my table very often and I was too excited about the dish I created to wait to post it. 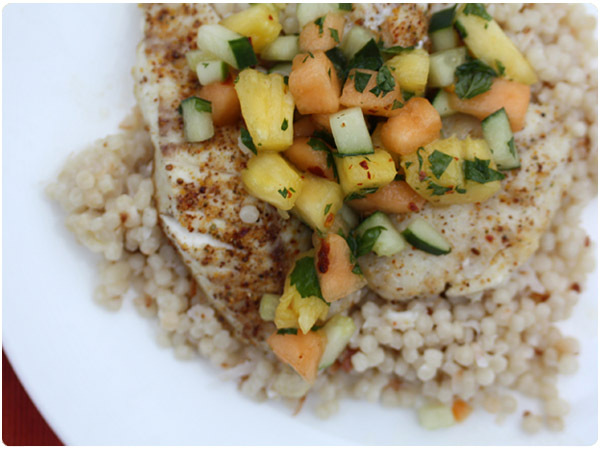 Back in May, we had taken a trip to Florida together and eaten plenty of fresh catch with bold tropical flavors. 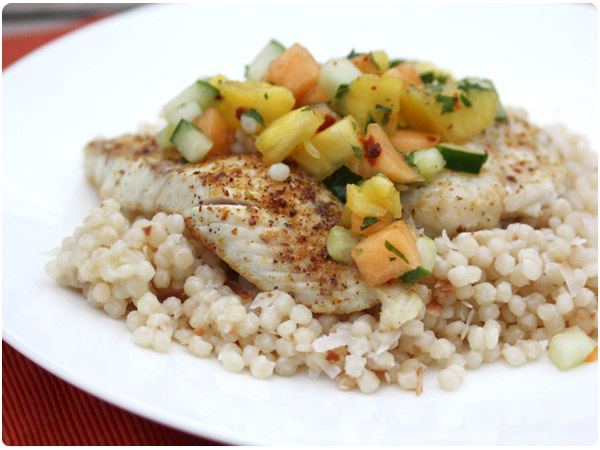 Taking a cue from the trip, I made a slightly sweet coconut couscous and a spicy cucumber melon salsa to serve with our lightly seasoned grilled fish. Big and bold yet light and fresh while still playing up the fish…made me wish I had saltwater fish to eat every day! Form a “plate” with aluminum foil and place fish on foil “plate”. Rub with olive oil so that fish is lightly coated. Season very lightly with garlic, ginger, Old Bay and salt. No need to measure specific amounts here – just lightly dust each piece with the spices. Grill fish for 5-7 minutes. Fish should be flaky and opaque. In a large sauce pan, combine couscous, water and coconut milk. Bring to a boil, then reduce heat to low and cover. Cook for 10-15 minutes until liquid is fully absorbed. Meanwhile, in a small saute pan, toast coconut over medium heat until golden brown, taking care not to burn – approximately 6-8 minutes. Add toasted coconut to couscous and season with salt. Fluff couscous with a fork and keep covered until other components are ready. In a small bowl, combine cantaloupe, pineapple and cucumber. Mix in mint. In a separate small bowl, combine oil, honey and lime juice, whisking until combined. Toss gently over fruit. Dust with salt and red pepper flakes to taste and mix to combine. Salsa should be the right mix of spicy, sweet and tangy for your taste.